It is never too early to examine a child; even a baby can be examined if required. 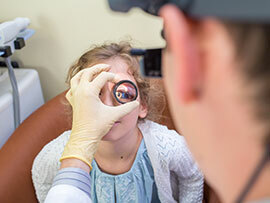 Delaying eye exams until the child is older is incorrect since the sooner an eye problem can be diagnosed, the sooner it can be treated, leading to a better prognosis. All children with a family history of eye defects and those that adjust their eyelids to see better, have a headache, visual fatigue, inability to concentrate or school problems should be examined. Premature babies should be examined as soon as possible and always before 4 months. 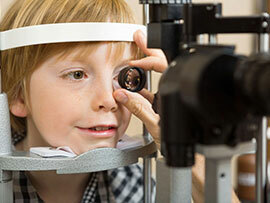 In infants and children under three years, vision cannot be measured, but the ocular structures can be checked to see if they are normal or defective, that is to say, you can check if the child has everything you need to see well. 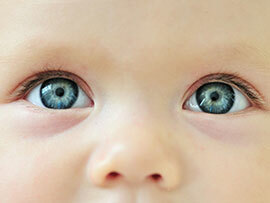 Pupillary reflexes, corneal brightness and eye movements are evaluated to detect possible strabismus. 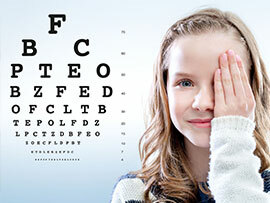 In older children, a child’s visual acuity can be measured with pediatric tests. The fundus and refractive errors can be measured at any age with the use of cycloplegic drops. Without them, it is impossible to calculate the exact degree in children neither with conventional methods nor with computerized systems. With dilated pupils, light is bothersome, and vision is blurred, but once the effect is over, vision returns to normal. Pupillary dilation has different durations (hours or days), depending on the type of eye drops or ointment used. Strabismus and amblyopia or “lazy eye” require special attention in children. Early diagnosis and treatment is essential for the proper visual development of our youngest patients. Learn more about strabismus, amblyopia, and pediatric ophthalmology.